A huge part of the charm of Austin, Texas is its neighborhoods. Austin is a collection of over a hundred different neighborhoods, each unique with its individual flair and character. Together, they add up to a wonderfully diverse range of neighborhood personalities. Maybe you're looking for somewhere to rent for a year or two. Or perhaps you're looking to settle down and find a place to buy and call your own. Whatever you want in a home, you'll find many choices in the Texas Capital City. From the proud quirkiness of SoCo to the quiet residential community of North Shoal Creek; from the urban bustle of Downtown to the natural beauty of Barton Creek, and the breathtaking hill country views of Cat Mountain - no matter what kind of locale you'd like to call home, chances are there's a area of Austin that's just right for you. 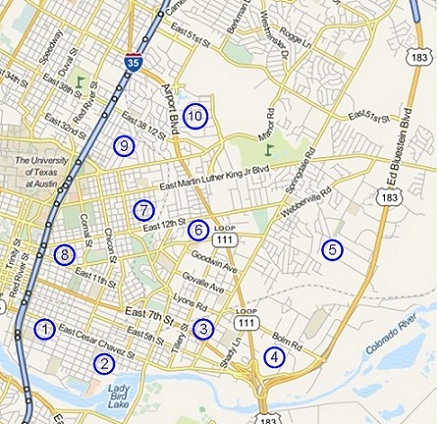 On these pages we profile a sample of the many neighborhoods in and near Austin. Browsing through these descriptions will show you the diversity of Austin's people, scenery, and local businesses. 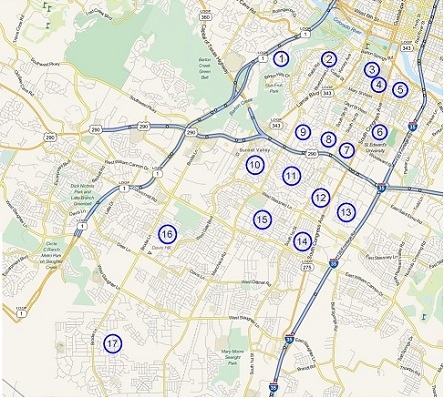 We invite you to take a virtual tour of Austin through these neighborhood profiles. Then, once you're here, we encourage you to explore a handful of neighborhoods that appeal to you. Whether you choose to stay for a few months or a few decades, you'll soon be writing your own chapter in the continuing story of our city. 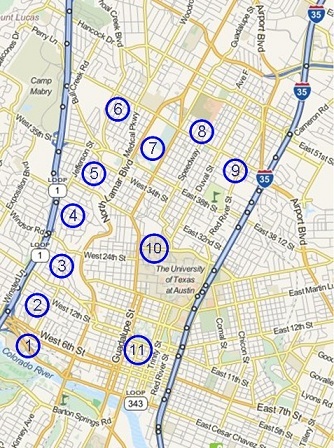 Austin's neighborhoods are grouped into nine geographical regions, each named for its location relative to the state capitol, in the heart of the city. 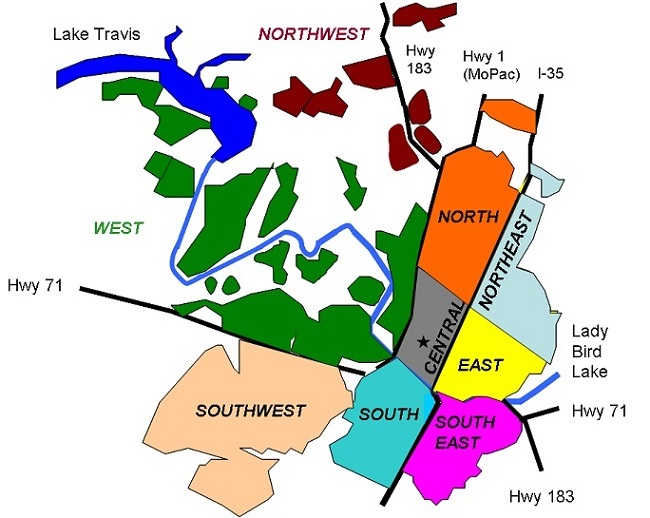 Below is a sketch of the Austin area and the nine regions comprising it. The major boundaries are Hwy. 1 (MoPac), Interstate Hwy. 35, and Lady Bird Lake. The lake separates central Austin from south Austin, and east Austin from southeast. Hwy. 1 forms the boundary between central and west, and I-35 divides central Austin from east. Read on to find out about the northwest, north, northeast, west, central, east, southwest, south, and southeast regions of Austin. Many of the neighborhoods offer amenities like Olympic-sized pools, playgrounds, parks, tennis courts, hike and bike trails, a community center, and even a fitness center and water park. The home prices are also attractive, starting under $200K in some sections. Homes in this area tend to be new, built in the 1970s and 80s in some sections, or after 2001 in others. Many homes are located along hilltops, providing outstanding views. Northwest Austin is one of the fastest-growing areas of town, and of the U.S. for that matter. As more people move there, new, top-rated schools and amenities are being added. For now, however, home prices remain reasonable. 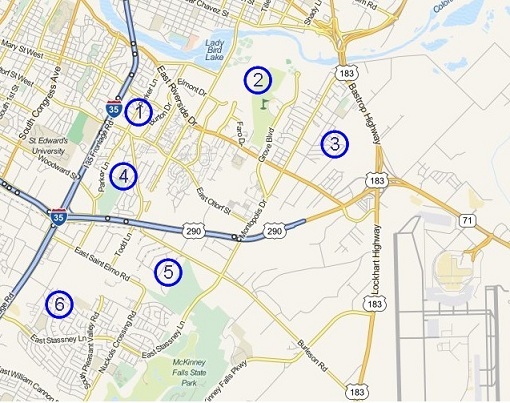 Northwest Austin is close to major highways, offering convenient commutes to other areas of Austin such as downtown, the University of Texas, and the lakes (not taking into account the infamous Austin traffic). Because of the traffic, it's best to live close to where you work. So choosing a home in northwest Austin is best if you also work in that area, such as at one of the nearby technology companies. Or if you work from home, or your working hours permit you to avoid the morning and evening rush hours. 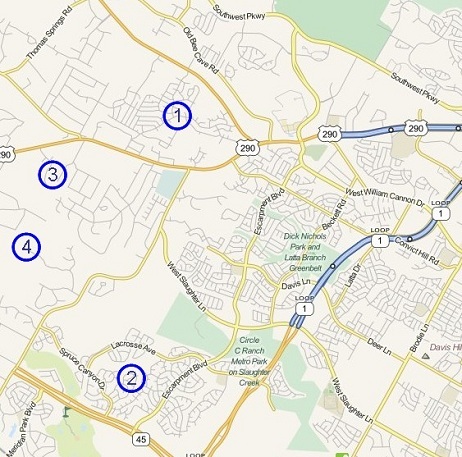 The map below shows some of the northwest Austin neighborhoods. 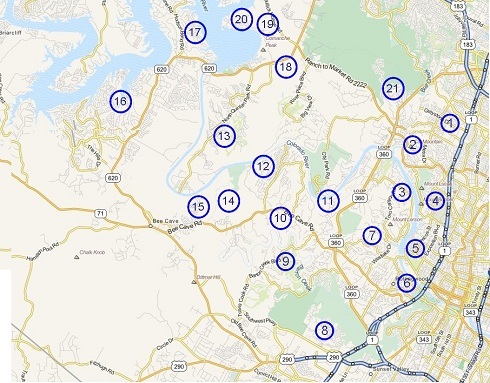 To find out more about a neighborhood, click on a number on the map or on one of the links to the right. Quiet, established, family-oriented neighborhoods, parks, restaurants, stores, and cafes, central location in Austin convenient to downtown and shopping - all of these make parts of north Austin among the more desirable locations to live for many locals. Singles, young families, empty nesters, and seniors are all attracted to call north Austin home. Many of the north Austin neighborhoods were formed shortly after World War II. Many veterans returning home settled in Austin and used their GI Bill benefits at the University of Texas. There are bungalow-style houses common in this area dating back to the late 1940s and 1950s. But the craftsmanship of these houses enabled them to stand the test of time, and many have been renovated and are in like-new condition. 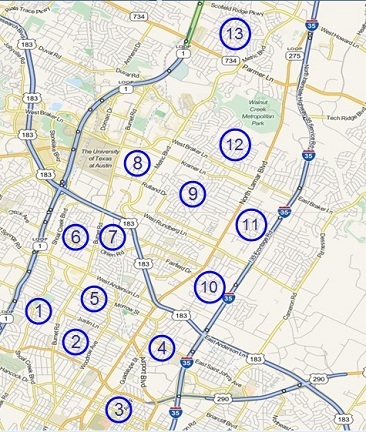 North Austin is sometimes called the "concrete jungle" because of all the shopping malls and office complexes. But this applies mainly to the north and west sections near 183 and 360. Further south, there's actually a lot of green space and family-friendly parks. Strong, close-knit communities underlined by active community associations. In some sections you can still see remnants of Austin's past, with 1950s-era diners and gas stations. Some of the houses and communities evoke images of America in the 1950s - streets lined with large, shady trees and modest, one-story homes with curved driveways and garages on the side. In other neighborhoods, you find ranch-style homes with larger lots and well-tended gardens. Further south, closer to downtown, the atmosphere is more like south Austin, with local stores, cafes, coffee shops, and live music. Many singles and University of Texas students and professors choose to live there because of the low housing costs and proximity to the university. The east section of north Austin, between Lamar Blvd. and I-35, is more of a gritty, working-class urban environment with supermarkets, strip malls, and mixed ethnic and fast food restaurants. 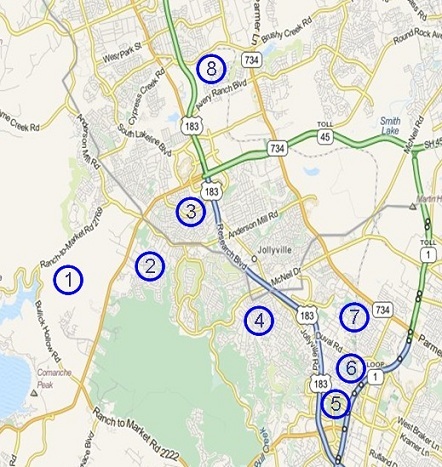 The map below shows some of the north Austin neighborhoods. 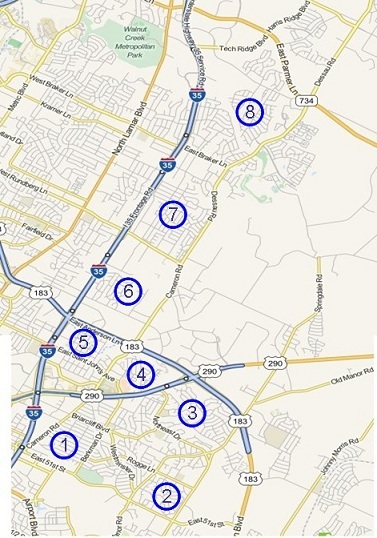 To find out more about a neighborhood, click on a number on the map or on one of the links to the right.